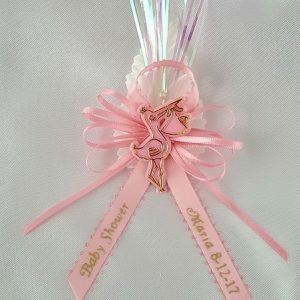 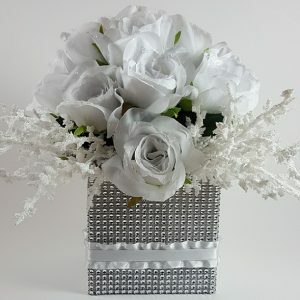 This gorgeous centerpiece will add classic elegance to your Wedding, Sweet 15 or Special Event decoration. 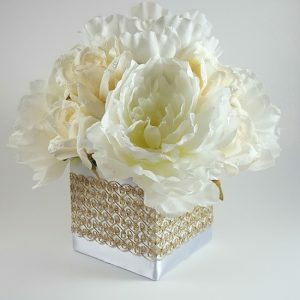 Featuring Peonies and Roses beautifully arranged in a square vase decorated with a gold metallic ribbon for a luxurious and sophisticated look. 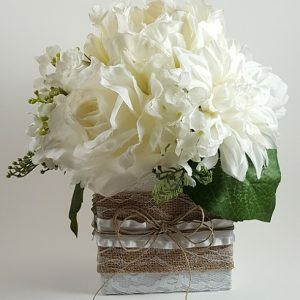 This beautiful mixture of roses, dahlias and peonies arranged in a square vase decorated with burlap ribbon and lace is the perfect centerpiece for your wedding, baptism, first communion or any special event.